Patrick Herlihy: My new position at Media Vision is director of system solutions. This is a new department at Media Vision, driven by the realization that we have always been more solutions driven than product driven, and we strive to provide superior support for anyone wanting to use our solutions in their designs. With technological advancements within our industry and our own product line—internal advancements in networked audio, room combination over fiber, multimedia terminals, multichannel audio on a single video stream, wireless E Ink displays, etc.—we had to take our support to the next level. Thus, my new department is focused on providing a higher level of system design support. Additionally, Media Vision and my responsibilities as director of sales for North America for the past three years had grown to the point where we needed to figure out a new strategy in order to get to the next level. My new responsibilities will be to better support our consultants, key end users, larger and more complex projects, as well as maintaining our internal training program. This allows us also to have a sales department that can focus on partnering with our reps and resellers, and the all-important job of generating revenue. With our growing operation in Europe, this is a global position that ensures Media Vision provides the same level of service and support on both sides of the pond. PH: I started just prior to Q4 in 2016, and have been busy with the transition ever since. 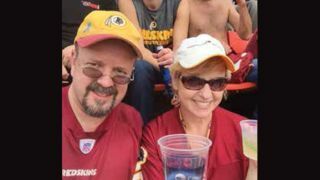 Herlihy and his wife Lisa at a Washington Redskins game.SCN: How has your background prepared you for your new role? PH: I have been working in the field of conferencing and language interpretation for 30 years now. I began my career providing these systems on a rental basis for international conferences for clients including the U.S. Department of State, the World Bank, the UN, and the IMF. About seven years in, I transitioned to designing and installation support for permanently installed systems. I have worked with three manufacturers of this equipment, so I am pretty familiar with our competition and understand system design at a level that allows me to be creative with the solutions we provide. This technology has evolved over the years from digitally controlled analog audio, to fully digital systems, to systems from TAIDEN that now provide video on demand, document sharing, video capture, and multichannel networked audio as well as E Ink nameplates and more. PH: Our short-term goals have been to successfully transition my former sales director responsibilities, onboard new team members, and begin implementation of our new consultant support processes. Long term, it is our goal to build this department into a premier global design-support group that will have a regional presence. SCN: What is the greatest challenge facing you? PH: I think one of my greatest challenges is that I am creating a new department within the company and must develop it into something that is both productive and complementary to our existing team. Having said that, this challenge is what makes the task exciting for me. I’m proud of the sales department and the team I developed in the past three years, and I am honored to be entrusted again with an opportunity to grow the company. SCN: Where do you see the conferencing and language interpretation market heading? PH: Onward and upward. We at Media Vision don’t sit still for very long, and are constantly looking for new opportunities to grow our business. We have been very successful in identifying new market verticals for our products, driving business through our existing channels, and offering new products to market. This combination has allowed us to not just survive, but to thrive during challenging economic times in the industry. SCN: Are there new initiatives we are likely to see from Media Vision? PH: Many. We are having our Global Sales Meeting in Napa Valley, CA at the end of January, and will be unveiling several new initiatives to our reps and internal team. Most of these are centered on increasing our end-user focus, a new plan for 2017, and better communicating how our systems solve problems for our customers. PH: We are always open to meeting new reseller partners that are interested in growing their business by opening their minds to our solutions. We will be announcing several new plans to provide our resellers with the tools to be more competitive with Media Vision solutions, and encourage them to contact us for more details. Matt Pruznick is managing editor of digital content for SCN and Residential Systems. Follow him on Twitter @Pruznick.